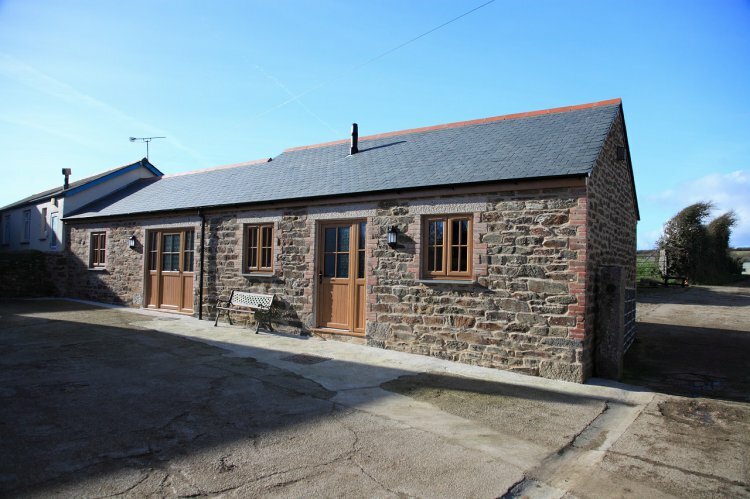 Anhay Stable is a new semi-detached stable conversion on a working farm just a stone's throw from the coast at Gunwalloe, Cornwall. Miles of walking are available in every direction as the South West Coastal path is easily accessible within half a mile. Nearby attractions include Flambards theme park and Gweek Seal Sanctuary, both just 10 minutes away while further afield Penzance, Land's End, St Ives and Truro all offer great days out. Entered from the parking area into a hallway with all rooms off. The open-plan kitchen, dining and living room is bright and spacious, there's two leather two seat sofas and a flat screen TV with DVD player and WiFi. The kitchen is equipped with electric oven and 4-ring hob with extractor over, fridge/freezer, dishwasher, kettle, toaster and microwave. Between the sitting area and kitchen is a glass top dining table with four chairs. The main bedroom features quality wood furniture, there's a 5' king-size bed with bedside tables and touch lamps and plenty of storage in the double wardrobe and chest of drawers. Bedroom two has a single bed with a second single trundle bed when required, a bedside table with lamp and a chest of drawers. The shower room has a large shower cubicle with mixer shower over, toilet, handbasin, heated towel rail and light up mirror with shaver socket. The bedrooms are carpeted and the rest of the property has tiled floor with under-floor heating throughout. The property benefits from a shared Laundry room with Anhay Cottage with washing machine and airer. Anhay Stable has a picnic area with picnic bench and a charcoal BBQ for your use. Anhay Farm is a working dairy farm and you are welcome to watch (and help!) feed the calves if you want to. Anhay Stable is part of the Anhay Farm family of cottages, the other cottages are displayed below.